On a recent trip to France I decided to ditch my digital SLR’s and do the unthinkable. I brought only my iPhone and a point and shoot camera instead of my heavy digital SLR’s. I was worried about the battery life of my phone as I didn’t want to be running to the hotel frequently to charge it up using the European adaptor. Instead, I brought the nifty PowerLift Back-up Battery, Dock and Stand by Kensington. It turned out to be a very wise decision. The item contains a lithium-ion polymer battery and has 4.0 Wh (watt hours). Kensington offers a two year limited warranty on the charger. The black and chrome battery charger is lightweight and compact, and easily slips into a pocket, purse, or camera bag. The unit measures 2.5″ x 2.3″ x 0.7″ and weighs 1.75 ounces. The device has a built-in USB cable that neatly tucks into the rear of the charger and has a power check button to indicate battery status. The dock connector is compatible with all recent generations of the iPod and iPhone. I also found that it charged my iPad 2 in a acceptable amount of time although the specifications do not mention the iPad. That was a pleasant surprise. Kensington specifies that the dock connection works with most cases and it did with my Griffin case. 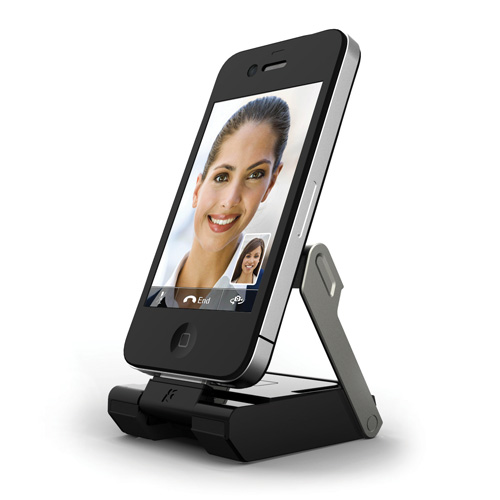 The front of the PowerLift charger has a kickstand which orients the iDevice in a portrait mode. I found it to be cumbersome and awkward to maneuver. It would be appropriate for FaceTime or to perhaps read a book on the iPod/iPhone. It’s a pity the unit does not support landscape mode as it would be a terrific charger to watch movies or stream video. Because of the kickstand’s clunkiness, I did not use that feature. When the kickstand is folded in, the charger extends down from the iPod/iPhone and is out of the way. The dock connector has a two-way adjustable feature but I found the device folding back onto itself when I was photographing which was annoying at times. My iPhone 3GS completely died during a lengthy photo shoot in Pére Lachaise cemetery but I plugged the PowerLift dock connector in and I was ready to go. As I continued to shoot photos, the charger did a fabulous job of charging my phone. Within an hour my iPhone was up to 94% from 3%. Kensington lists extended play time hours using the charger with the iPhone 3G, 3GS, and 4. Music ranges from 13 hours on the 3G to 20 hours on the iPhone 4. Video time is from 3.5 hours on the 3G to 5 hours on the 3GS and iPhone 4. Phone talk time is 3 hours on the 3G to 5 hours on the 3GS and 3.5 hours with 1.5 hours of FaceTime on the iPhone 4. Kensington does mention that as the PowerLift Back-up Battery, Dock and Stand is used over time, it will have reduced ability and the charge/music/video/talk times will decrease. That is typical of all products in this category and should not deter anyone from purchasing them and using them frequently. The USB charger easily plugs in to the Apple AC adaptor to recharge the PowerLift battery. As the USB tucks into the back of the device, the cable is very short: slightly over two inches. As I did not bring a USB extension cable with me, I placed the charger on top of the adaptor. A bit awkward but it worked. The PowerLift is sleek and compact, and there are sacrifices,among which the short USB cable is one. The button on the reverse side indicates the battery life of the PowerLift charger by four blue LED lights. I charged the PowerLift to full capacity and when I used it four days later, it was still full. When I checked the battery indicator after charging my phone to 100%, the indicator light read two lights, so I used half the PowerLift battery charge to charge the iPhone. Although I brought another portable battery device, I used the Kensington exclusively because of its fast recharge time. I appreciate the quick charging times but the kickstand is very clunky and I really wish it supported a landscape orientation. It’s reasonably priced as for a back-up battery and charger. Although it has its flaws, its compact design has found a permanent place in my bag next to my iPhone and crumbs from the best macaron patisserie in Paris.